I saw all the ones around like...South Bank. They were really nice. the Elephants are for sale! "Ampersand" (!) is my favourite and bidding for him/her is going very well indeed. Last I checked it was over £15,000! 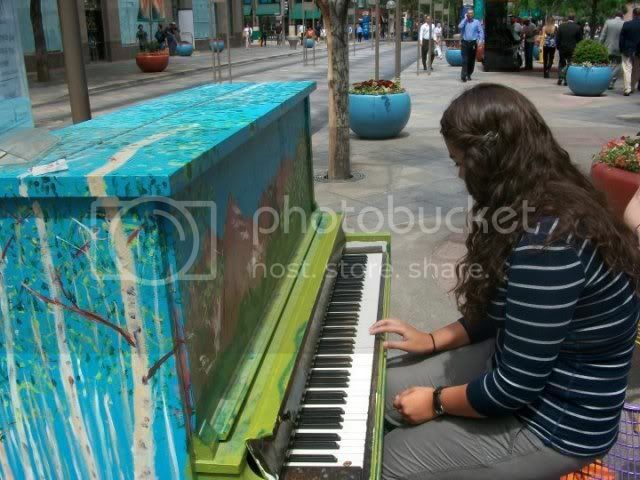 In Denver on 16th street, they have pianos that are free to play. There is one about every 2 blocks. omg, that is sooo cool. i would steal one. today they begin their migration. Happy wanderings, elephants! Royal Hospital Chelsea viewing day for the outdoor herd begins! See you there from 10am this morning. Entrance via the London Gate Entrance on Royal Hospital Road. Nearest tube is Sloane Square. And what a beautiful day to see a herd of elephants! my favourite elephant, "Ampersand" (pictured below) eventually went at auction for £100,000! the elephant parade (entire herd) raised over £4million in the end.